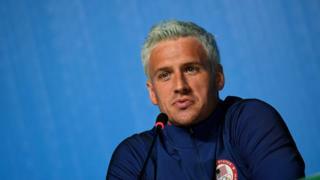 Police in Brazil have charged US swimmer Ryan Lochte with making a false statement about being robbed at gunpoint during the Olympics in Rio de Janeiro. The police statement also recommends that the court issues a summons for the gold medal winner. Mr Lochte flew out of Brazil after the Games before he could be questioned about the alleged false claim. He initially claimed that he and three fellow swimmers were robbed at gunpoint in a taxi by men with a police badge as they returned to the Olympic village from a party. But the police say he made up the story and officers produced video evidence that the group were actually challenged by security guards after they’d vandalised a petrol station toilet. The swimmer has admitted he was drunk and apologised, but he now has to decide whether or not to return to Brazil to defend the charges. The crime faces a maximum penalty of 18 months in prison and the 32-year-old can be tried in his absence. However, it is understood that if Mr Lochte did attend the hearing he could agree to pay a fine like fellow swimmer Jimmy Feigen, who was with him during the incident. Mr Feigen agreed to donate nearly $11,000 (£8,300) to a Brazilian charity to resolve the case. The US and Brazil have an extradition treaty which Brazil has flouted in the past. Authorities in the US could take the same stance if Mr Lochte is found guilty.